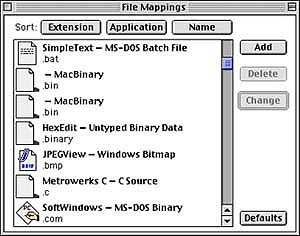 The latest version of the Palace Client for Macintosh uses software, called Internet Config, to pass selected file types to another program. This page shows you how to set up Internet Config to play Midi and MP3 files. First you will need to be using version 3.0.1 (or higher) or the Macintosh Palace Client. Check our download page for sites where to get it. These version of the Macintosh Palace Client is able to handle most multimedia files by passing them to another program through the Internet Config interface. Internet Config is a handy tool with many features. The important part for our discussion is the File Mappings feature. This allows you to specify what program you want to use to handle file types based on file name extensions. Second you need a program to play Midi and MP3 files. There are several programs available to play such files on the Macintosh. The QuickTime 4 Player can play both Midi and MP3 and it comes pre-instal led on all new Macintoshes and is also included when you install Mac OS9. If you don't already have it you can get it from Apple's QuickTime Site. Another excellent media player for Macintosh is SoundApp. This no frills program is able to play just about any type of sound and music file (including Midi and MP3) and it does it will very little obtrusive graphic interface. It is great for playing music files in the background for The Palace. You will still need to have QuickTime version 2.1 or later with its QuickTime Musical Instruments extension installed in order to play Midi files. There are several other MP3 player programs listed at MP3.com. The Internet Config program is included with version 3.0.1 of the Macintosh Palace Client. If you don't already have it installed it should install itself the first time you run it. You can do so by double clicking the icon (like the one on the left above) in the Internet Config 2.0.2 folder that was installed inside your Palace folder. If the program does not install for some reason, try copying the Internet Config Extension (the icon on the right above) into your Extension Folder. Restart your computer and try running Internet Config again. Once Internet Config is running you should see its Internet Preferences window like the one, below. Click once on the File Mappings tile, shown highlighted above. This will open the File Mappings window, shown below. Look in this window to see if there are already entries for .mid and .mp3 files. Click on the button to sort by Extension to make it easier to find. If you have entries for .mid and/or .mp3 files and they are using the program you want, then you need go no further - simply quit Internet Config. If you have entries for .mid and/or .mp3 but they are not using the program you want, highlight the entry and click the Change button. If you have no entry click the Add button. Either one will open the Mapping Entry window shown below. Do the following procedure for both .mid and .mp3 files. In the Mapping Entry window, fill in the information for the Name and Extension and select Binary Data, as shown. In the box for File Type box enter the letters, Midi for Midi files. In the smaller box next to File Creator enter the letters SCPL if you are using SoundApp to play the files or the letters TVOD if you are using QuickTime Player. In the larger box enter the name of the program, SoundApp or QuickTime Player. 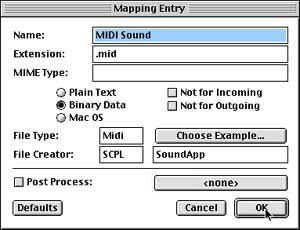 If you are using a different program to play the Midi files you can fill in the File Creator fields by clicking on Choose Example. That will bring up a standard File Open dialog. Use that to find and select the program that you want to play Mthe files. This may also replace the letters for File Type. If it does, re-enter the letters Midi in that field. Your Mapping Entry should look similar to the one shown above. Now click on OK in the Mapping Entry to close it. Repeat the steps in the previous paragraphs for MP3 files. Fill in .mp3 for the Extension and use "MP3 Sound File" for the Name. Enter the letters MPEG for the File Type and fill in the File Creator fields as before. These will be SCPL and SoundApp for SoundApp or TVOD and QuickTime Player if using QuickTime. Use the Choose Example method if you are using a different program to play MP3 files and remember to replace the entry for File Type to MPEG. Your Mapping Entry for MP3 files should look similar to the one shown below. Now click on OK in the Mapping Entry to close it. Finally, save the Internet Config settings (from its File menu) and quit Internet Config. At this point you should be all set to play Midi files with a .mid extension and MP3 files with a .mp3 extension from within the Palace. This same procedure may be used to set up Internet Config to play other file types from the Palace. You just need to know the file extension and have a program to play the files. For example, substitute .mov for .mid and select QuickTime Player for QuickTime move files. In some situations the media player may not be launched properly the first time you play a file. If this happens try starting the player application, yourself, so it is ready and waiting for you to select a file in the Palace.